One of the diagnostic hallmarks of the histological lesions associated with celiac disease is the extensive infiltration of the small intestinal epithelium by CD8+ T cells of unknown Ag specificity. In this study, we report recognition of the gliadin-derived peptide (A-gliadin 123–132) by CD8+ T lymphocytes from celiac patients. A-gliadin 123–132-specific IFN-γ production and cytotoxic activity were detected in PBMCs derived from patients on gluten-free diet, but not from either celiac patients on gluten-containing diet or healthy controls. In contrast, A-gliadin 123–132-specific cells were isolated from small intestine biopsies of patients on either gluten-free or gluten-containing diets. Short-term T cell lines derived from the small intestinal mucosa and specific for the 123–132 epitope recognized human APC pulsed with either whole recombinant α-gliadin or a partial pepsin-trypsin gliadin digest. Finally, we speculate on a possible mechanism leading to processing and presentation of class I-restricted gliadin-derived epitopes in celiac disease patients. Celiac disease (CD)3 is characterized by a marked intolerance to dietary gliadin, and is associated with an extensive lymphocyte infiltration of the small intestinal mucosa (1). In particular, a large infiltrate of CD8+ T cells is usually found in the epithelium, while CD4+ lymphocytes infiltrate the lamina propria (2, 3, 4, 5). Several studies have implicated the involvement of gliadin-specific lamina propria CD4+ T cells in the induction of CD intestinal mucosal damage (6, 7, 8, 9). It is hypothesized that in genetically predisposed individuals, gliadin-specific T cells become activated and that the local production of proinflammatory cytokines damages the intestinal mucosa. Because of the association of disease with DQα1*0501/DQβ1*0201 (HLA-DQ2) or DQα1*0301/DQβ1*0302 (HLA-DQ8) heterodimers, these two molecules have been postulated to present specific epitopes to pathogenic T cells. Indeed, several gliadin-derived peptides have been reported to react with T cell clones isolated from celiac intestine (8, 9, 10). Recognition of gliadin peptides by HLA-DQ2- and HLA-DQ8-restricted CD4+ T lymphocytes isolated from intestinal mucosa of CD patients seems to support the role of CD4+ T cell-mediated responses in the CD lesion. However, a clear and definitive demonstration of the pathogenic role of these class II-restricted, gliadin-derived peptides is still not available. By contrast, one of the most characteristic histological findings of CD intestinal biopsies is the extensive infiltration of the epithelium by CD8+ T lymphocytes. CD8+ cell infiltration is observed in all forms of CD-associated intestinal lesions (total, subtotal, or partial atrophy of villous surface) (2, 5). Moreover, a marked infiltration of CD8+ cells is observed in the epithelium of CD mucosa challenged in vitro with gliadin (4, 11). This is not only associated with overt disease, but is also present and has diagnostic relevance in silent or latent CD cases. However, the Ag specificity of these CD8+ T lymphocytes and the mechanisms leading to their expansion in CD intestinal mucosa are unknown. Several studies have suggested a potential role for class I-restricted T cells in autoimmune diseases. GAD-specific CD8+ T cells have been described in pancreatic isles of patients with insulin-dependent diabetes mellitus and in the peripheral blood of individuals with high risk to develop insulin-dependent diabetes mellitus (12). Moreover, recognition of pancreatic B cell Ags by autoreactive CD8+ T cells has been invoked as a crucial step in the development of insulitis and diabetes in nonobese diabetic mice (13). Besides their role as effector cells, CD8+ cells can also be involved in initiation of the pathogenesis of diabetes (14, 15). Massive oligoclonal expansion of CD8+ T cells has been reported in the brain and peripheral blood of multiple sclerosis patients (16, 17), suggesting that direct cytolysis and proinflammatory cytokine secretion by CD8+ T lymphocytes may be involved in the destruction of brain myelin in multiple sclerosis patients. In the present study, we have examined whether CD is associated with recognition of class I-restricted, gliadin-derived epitopes. Twenty HLA-A2-positive CD patients (mean age 14.2 years; range 2–30 years) were enrolled in this study. All CD patients were diagnosed according to the European Society for Paediatric Gastroenterology Hepatology and Nutrition criteria (18), 12 were on a gluten-free diet (GFD) for at least 2 years and serum negative for anti-endomisium Ab (EMA), 1 didn’t follow a strict GFD and was found to be EMA positive, and 7 were at the first presentation of acute disease and on a gluten-containing diet (GCD). Jejunal biopsy specimens were obtained from 6 CD patients on GCD (mean age 5.5 years; range 2–12 years) and from 4 patients on GFD for at least 2 years (mean age 24 years; range 16–30 years). PBMCs from 7 adult healthy volunteers were used as controls. All patients and controls were serologically typed for MHC class I alleles by using commercial typing kit (EsseMedical, Milan, Italy). HLA-A*02 subtype, DQA1, DQB1, and DRB1 genotypes were determined by PCR methods using commercial HLA typing kits (Dynal, Oslo, Norway). All CD patients were recruited from Naples area and gave their full consents to the experiments. The amino acid sequence of A-gliadin (GenBank, accession number 170722) was scanned for the presence of HLA-A*0201-binding motifs. Briefly, a specific algorithm that takes into account the influence of both primary and secondary anchor residues was used (19, 20). Potential A*0201-binding gliadin peptides were synthesized, as previously described (20). Peptides were purified by reverse-phase HPLC. Purity (>95%) and identity were assessed by analytical reverse-phase HPLC, mass spectrometry, and analytical sequencing, respectively. The capacity of A2-binding motif gliadin peptides to bind purified HLA-A*0201 molecules was analyzed by a quantitative inhibition assay, as previously described (19, 20, 21). Briefly, 1–10 nM iodinated probe peptide was coincubated for 2 days at room temperature with various amounts of purified HLA-A0201 molecules (obtained from EBV-transformed cell line JY), in the presence of 1 μM of β2 microglobulin (Scripps Laboratories, San Diego, CA) and protease inhibitors. Unbound peptide was separated by class I/peptide complexes by gel filtration on TSK200 columns (Toso Haas, Montgomeryville, PA), and the fraction of free peptides was calculated as described (22). Peptides were tested in two to four independent experiments. Recombinant α-gliadin was purified by HPLC (S. Senger, D. Luongo, F. Maurano, M. F. Mazzeo, R. A. Siciliano, C. Gianfrani, D. Chella, R. Troncone, S. Auricchio, and M. Rossi, manuscript in preparation). The complete amino acid sequence of α-gliadin was reported by Kasarda and D’Ovidio (23) and contains the whole sequence of A-gliadin 123–132, QLIPCMDVVL. A peptic-tryptic digest of gliadin extracted from San Pastore cultivar according to the method previously described (24) was kindly provided by M. De Vincenzi (Istituto Superiore di Sanità, Rome, Italy). Gliadin-specific T cell responses were evaluated both in freshly isolated PBMCs and in gut mucosa-derived short-term T cell lines by IFN-γ ELISPOT assay, as previously described (25). Briefly, 96-well nitrocellulose-backed plates (MAHA S4510; Millipore, Bedford, MA) were coated with 10 μg/ml of anti-IFN-γ mAb (BD PharMingen, San Diego, CA) overnight at 4°C. Plates were extensively washed with PBS, blocked with PBS/5% FCS, and incubated with effector cells. In PBMC assays, 2 × 105 cells were plated in the presence of 10 μg/ml of gliadin-derived peptides or the A*0201-restricted, influenza A virus (FLU) 58–66 CTL epitope as a positive control; when biopsy-derived, short-term T cell lines were assayed, 5 × 104 cells were plated in the presence of 1 × 105 irradiated, autologous PBMCs and 10 μg/ml of specific peptide. After 20 h of incubation at 37°C and 5% CO2, plates were extensively washed with PBS/0.05% Tween 20 and incubated for 2 h with biotinylated secondary anti-IFN-γ Ab. Thereafter, plates were washed, and streptavidin HRP (BD PharMingen) was added for 1-h incubation. Spots were developed by adding aminoethyl carbazole (Sigma-Aldrich, St. Louis, MO) solution, and IFN-γ spot-forming cell (SFC) was counted by an immunospot image analyser (A.EL.VIS, Hannover, Germany) or blindly at a stereomicroscope (Leica GZ6, Buffalo, NY) by two separate observers. Gliadin-specific CTLs were generated according to a protocol previously described (22). Briefly, 4 × 106 freshly isolated PBMCs from HLA-A*02-positive CD patients on GFD were suspended in 1 ml of culture medium containing 10% human serum and were stimulated with 10 μ/ml of A-gliadin-derived or FLU-M1 58–66 peptides. After 1 wk, each culture was restimulated with 2 × 106 (3000 rad) adherent mononuclear cells pulsed 2 h with 10 μg/ml of each peptide in the presence of 3 μg/ml of β2-microglobulin (Calbiochem, San Diego, CA). Cultures were fed by adding 1 ml of fresh medium and 20 U/ml of IL-2 at days 3, 6, 9, and 12. Seven days later, cultures were individually assayed for cytolytic activity by a standard 6-h 51Cr release assay. Briefly, 1 × 106 autologous EBV-transformed B cells or HLA-A*0201 homozygous JY cells were pulsed overnight with either medium or 10 μg/ml of peptides in the presence of 3 μg/ml of β2-microglobulin. Cells were then washed, labeled 1 h with 100 μCi of 51Cr, and plated in presence of various numbers of effector cells. A total of 105 K562 cells was added into each well to inhibit nonspecific NK cytolytic activity. Specific lysis was calculated by using the following formula: 100 × (experimental release − spontaneous release/(maximal release − spontaneous release). Cultures were considered positive if net lysis was ≥10%. Jejunal biopsies (3–4 mm in size) obtained from CD patients were enzymatically digested with 1 mg/ml of collagenase A under a gentle shaking for 1 h at 37°C and 5% CO2. Detached cells were harvested and plated in the presence of 1 × 106 of irradiated or mitomycin-treated autologous PBMCs and 10 μg/ml of gliadin-derived peptide. Twenty-four hours later, cultures were fed with 1 ml fresh medium and 20 U/ml IL-2. Seven days later, CTL cultures were assayed in the IFN-γ ELISPOT assay, as described above. To identify peptides potentially recognized by class I-restricted T cells, the amino acid sequence of A-gliadin was first examined for the presence of HLA-A*0201-binding motifs (19). A total of seven 9- or 10-mer peptides was evaluated for binding to purified HLA-A*0201 molecules (Table I⇓). Four of them bound with good affinity to HLA-A*0201 (IC50 < 500 nM) and were selected for additional experiments. PBMCs were assayed for their capacity to recognize the four HLA-A*0201-binding peptides in an IFN-γ ELISPOT assay. The PBMCs used were freshly isolated from HLA-A*02-positive CD patients either on GCD or on GFD (Table II⇓), and HLA-matched healthy controls. 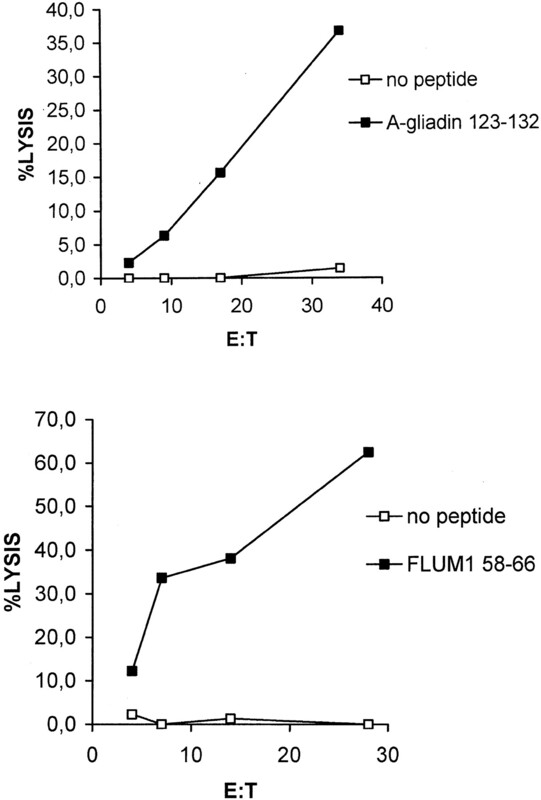 An A2-restricted immunodominant epitope derived from influenza A virus matrix protein (FLU-M1 58–66, GILGFVFTL) (26) was used as a positive control. Each peptide was tested in seven different CD patients on GFD, six different CD patients on GCD, and in at least five healthy A*02 control subjects. The results obtained are presented in Fig. 1⇓ and are expressed as net IFN-γ-SFCs/106 PBMCs (SFC in the presence of peptide minus SFC in the absence of peptide/total cells). A-gliadin 123–132 (QLIPCMDVVL)-specific IFN-γ-secreting cells from CD patients. Gliadin-specific IFN-γ-releasing cells were detected in peripheral blood-derived mononuclear cells of HLA-A*02+ CD patients on GFD, on GCD, and HLA-matched healthy controls (normal) by 20-h ELISPOT assay. Results are shown as net IFN-γ-SFCs/106 PBMCs (SFCs in presence of peptide minus the SFCs in absence of peptide/total cells). Hatched lines indicate the mean plus 2 SDs of responses from control subjects. In the case of the FLU-positive control epitope, average frequencies of 32/106, 29/106, and 19/106 were detected in normal, GFD, and GCD subjects, respectively. In the case of the gliadin-derived peptides, the mean plus 2 SD SFC/106 value observed in normal controls was calculated for each peptide. Responses exceeding these values (indicated as hatched lines in Fig. 1⇑) were considered significant. In the case of the A-gliadin 123–132 peptide (QLIPCMDVVL) IFN-γ-secreting cells, 15–75 SFCs/106 were detected in four of the seven patients tested that adhered to GFD. Interestingly, no significant responses were observed in patients on GCD, despite the histological evidence of villous atrophy after jejunum biopsy (Table II⇑ and Fig. 1⇑). Finally, significant numbers of IFN-γ-producing cells were not detected in the case of the gliadin peptides 123–131, 144–152, and 172–180. Recent studies have shown that the deamidation of glutamine residues into glutamic acid may enhance the immunogenicity of class II-restricted gliadin peptides, because of an increased binding affinity for the disease-predisposing DQ2 and DQ8 molecules (9, 10, 27). We synthesized the glutamic acid analog of A-gliadin 123–132 peptide ELIPCMDVVL and analyzed its capacity to bind purified HLA-A*0201 molecules. The A-gliadin 123–132 (E123) analog showed only a weak binding affinity for HLA-A0201 molecule (IC50 > 4600), thus rendering its recognition from A-gliadin 123–132-specific T cells unlikely. Indeed, when the deamidated epitope was tested under similar conditions to the ones described above, it was not recognized by PBMCs of either normal subjects, or CD patients (data not shown). To test whether A-gliadin-specific T cells derived from PBMCs of CD patients possessed cytotoxic activity, PBMCs from six different HLA-A*02-positive CD patients on GFD were stimulated in vitro with 10 μg/ml of the various A-gliadin peptides. 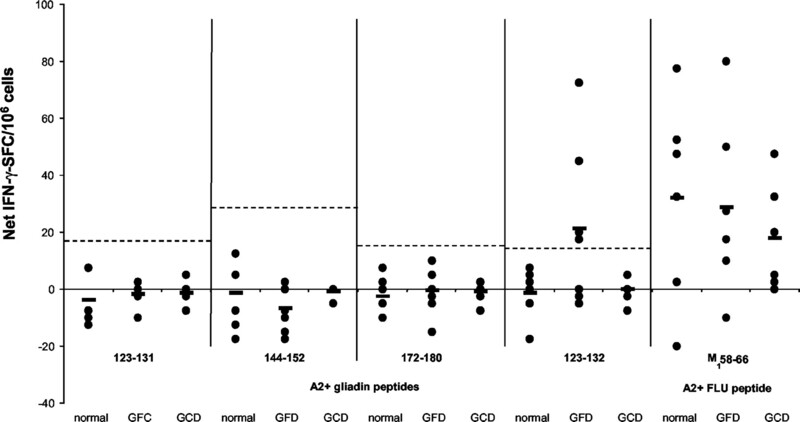 Cytotoxicity was evaluated only in CD patients on GFD because no A-gliadin 123–132-specific T cell responses were detected in peripheral blood of patients under disease and on GCD by the sensitive IFN-γ ELISPOT. The FLU-M158–66 epitope was also included as a positive control. Fourteen days later, cultures were individually assayed for cytolytic activity using 51Cr-labeled target cells incubated overnight with specific peptides. CTL activity was only observed in the case of the A-gliadin 123–132 and FLU-M158–66 epitopes. As in the case of IFN-γ ELISPOT assay on freshly isolated PBMCs, no response was detected against the other gliadin peptides (data not shown). Positive CTL responses (specific lysis ≥10% at 15:1 or higher E:T ratio) were detected in two of six and in five of six CD patients for the A-gliadin 123–132 and FLU-M158–66 epitopes, respectively. Representative results are shown in Fig. 2⇓. In the case of A-gliadin, 123–132-specific lysis approaching 40% at an E:T ratio ∼35:1 was observed. In the same patient, FLU-specific CTL activity of ∼40% was observed at the 15:1 E:T ratio. In conclusion, our results demonstrate that A-gliadin 123–132 can recall specific T cell responses in peripheral blood of CD patients and that these recall responses are associated with cytotoxic activity. A-gliadin 123–132-recalled cytotoxic T cell responses in peripheral blood of CD patients. 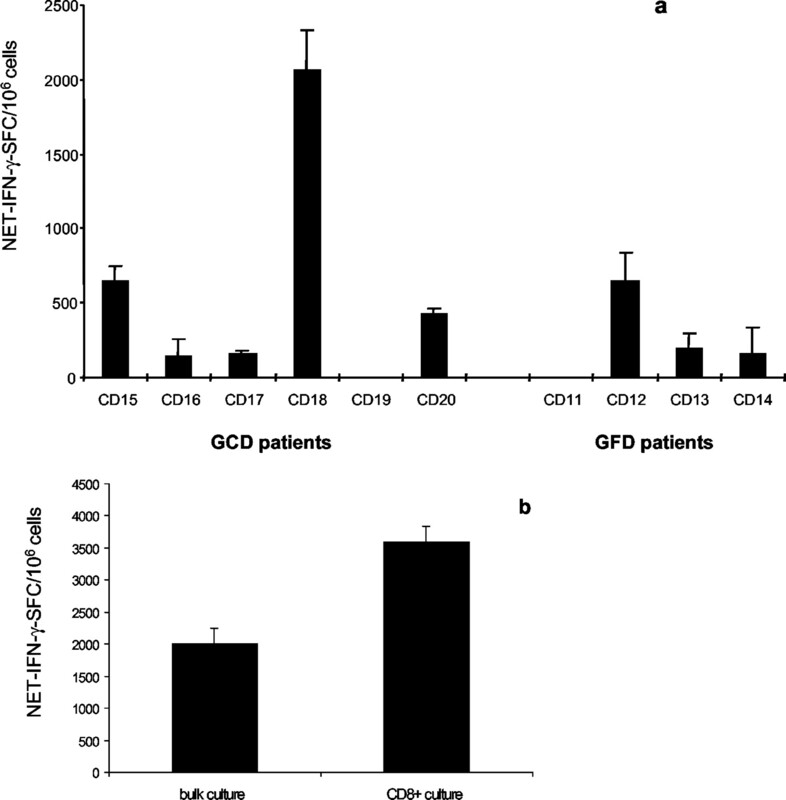 Fresh PBMCs from CD patients on GFD were stimulated twice with 10 μg/ml peptide and tested for cytolytic activity by a standard 51Cr release assay. 51Cr-labeled HLA-A*0201 JY cells pulsed overnight with medium or 10 μg/ml peptide were used as target cells. Next, we investigated whether A-gliadin 123–132 is recognized by T lymphocytes infiltrating the small intestinal mucosa of CD patients. Biopsy samples from 10 different CD subjects were analyzed (Table II⇑). Those samples were obtained from the proximal jejunum of four subjects on GFD (associated with histologically normal mucosa) and six on GCD (associated with histologically flat mucosa). Biopsies were immediately processed, and T cell lines were generated by stimulating mucosal cells with A-gliadin 123–132. Cultures showing signs of positive cell growth were then assayed in the IFN-γ ELISPOT assay. Statistical significance was evaluated by Student’s t test comparing IFN-γ responses in presence of A-gliadin 123–132 with no peptide controls. A-gliadin 123–132 was recognized in five of six patients on GCD and in three of four subjects on GFD (net average IFN-γ SFCs of responders was 570/106 with a range of 140–2250/106 for GCD patients, and 260/106 with a range of 160–650/106 for GFD; Fig. 3⇓a). Although a trend toward higher responses was detected in terms of magnitude of IFN-γ responses in patients on GCD, the difference between the two cohorts of patients did not reach statistical significance (p > 0.1 by Student’s t test). Recognition of A-gliadin 123–132 peptide by CD8+ T lymphocytes infiltrating the intestinal mucosa of both GCD and GFD CD patients. Short-term T cell lines were generated after one in vitro stimulation of jejunal mucosa-derived cells with specific peptide and autologous PBMCs as APC. Seven days after, cultures were assayed for recognition of A-gliadin 123–132 by a 20-h IFN-γ ELISPOT assay. Irradiated autologous PBMCs were used as APCs. IFN-γ responses are shown as net-SFC/1 × 106 mucosal cells (mean SFC/1 × 106 in presence of peptide minus mean SFC/1 × 106 in absence of peptide) (a). CD8+ T cells were purified with magnetic beads from a short-term T cell line obtained from a GCD CD patient. Net IFN-γ responses to A-gliadin 123–132 from both bulk cultures and CD8+ purified cultures are shown (b). To further analyze the phenotype of A-gliadin 123–132-responsive mucosal T lymphocytes, cell cultures obtained from three separate GCD patients, as described above, were purified by immunomagnetic CD8 separation, and assayed for recognition of A-gliadin 123–132 in the IFN-γ ELISPOT assay. In bulk CTL cultures, the percentage of CD8+CD3+ cells ranged from 73 to 85.5 (mean 79 ± 6.3), and net IFN-γ-secreting cells were in the 430–2000/106 range (mean 1023/106 ± 852). After the purification, the percentage of CD8+CD3+ cells increased to 97–98 (mean 97.5 ± 0.5), and net IFN-γ-secreting cells were in the 550–3600/106 range (mean 1680/106 ± 1671). Representative data are presented in Fig. 3⇑. In this case, the bulk cell culture (before purification) was composed by 79% CD3+ CD8+ cells, as suggested by cytofluorometric analysis, and contained ∼0.2% (2000/106) A-gliadin 123–132-responsive cells. Purified cells were >97% of CD3+CD8+ and contained 0.36% (3600/106) peptide-specific cells (Fig. 3⇑b). Intracellular cytokine staining of the same bulk T cell culture showed that cells producing IFN-γ in response to A-gliadin 123–132 were of CD8+ phenotype (data not shown). Taken together, these results demonstrate that the A-gliadin 123–132-specific T cells that secrete IFN-γ are of CD8+ phenotype. To determine whether A-gliadin 123–132-specific CTLs are able to recognize Ag in the form of whole or partially processed (digested) gliadin, a short-term CTL line was derived from a GCD mucosal biopsy by restimulation with A-gliadin 123–132. To assay for the recognition of different gliadin preparations, a peptic-tryptic digest of gliadin (24) and whole recombinant α-gliadin (23) were used to sensitize overnight 106 autologous PBMCs. After extensive washing, purified CD8+ cells were added and immediately assayed by IFN-γ ELISPOT. Both the enzymatic digest and the recombinant gliadin were efficiently recognized (Fig. 4⇓a). 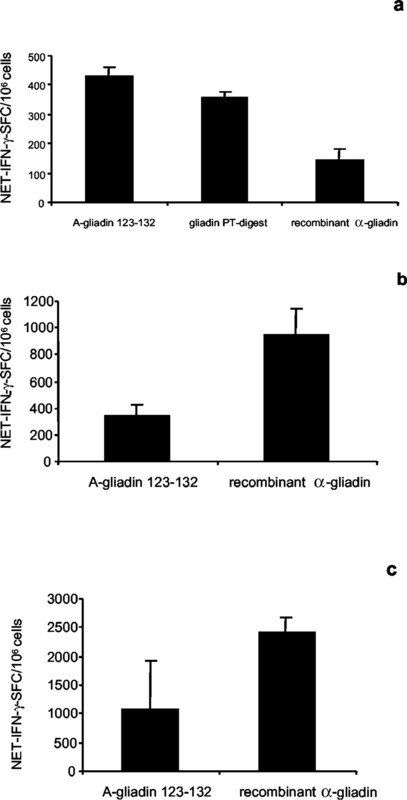 Recognition of intact and partially processed gliadin from A-gliadin 123–132-specific T cells. Gliadin-specific, CD8+ T lines were generated after two cycles of peptide stimulation of cells obtained from intestinal mucosa of a GCD patient (a) and from PBMCs of two different GFD patients (b and c). T cell lines were assayed for gliadin recognition by 20-h IFN-γ ELISPOT assay. Autologous PMBCs (a) or the 221.A2 cell line (b and c) were used as APC. All APC were pulsed overnight with 10 μg/ml A-gliadin 123–132, 30 μg/ml recombinant α-gliadin, and 100 μg/ml peptic-tryptic digest of gliadin (PT-gliadin) before being added to effector T cells. To confirm and expand these results, additional experiments were performed using the 221.A2 cell line. These cells were derived by transfection with A*0201 cDNA of an EBV-derived B lymphoblastoid cell line negative for any class I molecule expression (28). Using two different A-gliadin 123–132-specific T cell lines obtained by peptide stimulations of purified CD8+ cells from PBMCs of GFD patients, efficient recognition of both A-gliadin 123–132 peptide and recombinant gliadin was demonstrated (Fig. 4⇑, b and c). Because the A*0201 molecule is the only class I molecule expressed by the 221.A2 APC, these experiments formally demonstrate the HLA-A*0201 restriction of the A-gliadin 123–132 epitope. Taken together, these data demonstrate that whole and partially digested gliadin can enter the class I-processing pathway, and that the relevant peptide/MHC complex is formed and presented for T cell recognition. To further corroborate these findings, it may be interesting to analyze the cytolytic responses of purified CD8+ cells to A-gliadin 123–132 epitope or recombinant gliadin. Unfortunately, because of the short supply of clinical samples, we were unable to obtain enough purified CD8+ cells from celiac PBMC or intestinal mucosa to perform cytotoxicity experiments. The immune mechanisms leading to the damage of the small intestinal mucosa in patients affected by celiac disease, a permanent intolerance to dietary gliadin, are not yet completely understood (1). Both CD4- and CD8-positive T cells could be involved in the development of intestinal CD lesion, given the extensive infiltrations of CD4+ lymphocytes in lamina propria, and of CD8+ T cells in the epithelium of CD mucosa (2, 3, 4, 5). According to a prevalent theory, gliadin peptides are presented by the disease-predisposing HLA-DQ2 and HLA-DQ8 molecules and activate intestinal CD4+ T cells to produce proinflammatory cytokines (1). In particular, several studies have pointed out the key role of IFN-γ production for the induction and maintenance of CD intestinal lesion (6, 7, 29, 30). In contrast, the extensive epithelium infiltration by CD8+ T lymphocytes, observed in many forms of the CD intestinal lesion (total, subtotal, or partial mucosal atrophy), represents recurrent histological findings and an important hallmark of the overt disease. Oberhuber and colleagues (31) observed activated cytotoxic T cells containing large granzyme B-positive granules in atrophic CD intestinal biopsies. Other studies (32, 33) reported increase expression of Fas ligand, perforin, and CD94 in the intestinal epithelium lymphocytes of CD patients. However, the Ag specificity of these CD8+ T cells and their role in the celiac intestine inflammation are still unknown. In the present study, we report that a gliadin-derived peptide (A-gliadin 123–132; QLIPCMDVVL) is selectively recognized by HLA-A*0201-restricted CD8+ T lymphocytes isolated from CD patients. A-gliadin 123–132-specific CD8+ cells secreted IFN-γ and lysed target cells upon recognition of cognate peptide. Interestingly, A-gliadin 123–132 was found to recall specific IFN-γ responses selectively in PBMCs from CD patients on GFD. In contrast, A-gliadin 123–132 was recognized by T lymphocytes infiltrating the small intestinal mucosa of the majority of patients on GCD that did not show a PBMC response. The discrepancy could be due either to the recruitment and preferential localization of gliadin-specific T lymphocyte cells at the site of intestinal mucosa tissue or to increased apotosis of specific T cells in the periphery during the acute disease (34, 35). Our findings are consistent with the hypothesis that the gliadin-specific memory lymphocytes are preferentially localized to mucosal tissue and that, after resolution of small intestine inflammation and removal of antigenic stimuli by gluten withdrawal from the diet, re-enter in the peripheral circulation. Future studies will evaluate the expression of homing receptors such as α4β7 on the circulating and mucosa-infiltrating CD8+ T cells, and gliadin-specific CD8+ T cells in particular. Recognition of the A-gliadin 123–132 peptide was also associated with cytolytic activity. Thus, our data suggest that recognition of A-gliadin 123–132 may contribute to the inflammation of intestinal mucosa by the release of proinflammatory cytokines, such as IFN-γ, and by direct lysis of epithelial cells presenting naturally processed gliadin peptides. The present study is the first report of class I-restricted recognition of a dietary Ag linked to food intolerance in general, and specifically in CD, a disease that shares many pathogenetic traits with autoimmune diseases. Indeed, previous reports have demonstrated the involvement of CD8+ responses in autoimmune diseases. Class I-restricted CD8+ T cells are involved in the early events leading to insulitis and in the late destructive phase of diabetes both in humans and in mouse models (12, 13, 14, 15). Interestingly, Panina-Bordignon et al. (12) could isolate HLA-A2-restricted GAD-specific CD8+ cells from the pancreatic islet of diabetic patients, but not from the blood of newly diagnosed diabetic patients, consistent with the notion that pathogenic T cells localize at the site of expression of the target Ag. In addition, HLA-A2-restricted CD8+ T responses have been recently identified in primary biliary cirrhosis (36), and HLA-B27-retricted CD8+ cells specific for self peptides were described in patients affected by ankylosing spondylitis (37). Our results are the first to extend a possible role of CD8+ Ag-specific cells to CD. One fundamental question regarding the possible mechanism allowing recognition of gliadin-derived epitopes in the context of class I molecules is whether an exogenous Ag such as gliadin can access the class I-processing pathway. This question has been addressed by work from Lefrancois and colleagues (38) that demonstrated how an exogenous intact soluble protein, such as the dietary OVA, can enter MHC class I Ag presentation pathway and induce a mucosal cytotoxic T response in mice. Moreover, Grant and Rock (39) showed that APC from both thymus and spleen of normal mice can present exogenously supplied OVA to MHC class I-restricted T hybridoma. In addition, Ke and Kapp (40) reported that B cells internalize exogenous Ag in MHC class I-processing pathway by a receptor-mediated uptake. It is also well known that activated and transformed B cells (but not resting ones) can internalize exogenous Ags (41). We found that A-gliadin 123–132-specific CD8+ T lymphocytes recognize target cells (PBMCs or EBV-transformed B cells) pulsed with whole or enzymatically digested gliadins. These findings are compatible with the uptake of exogenous Ags and their delivery to the class I-processing pathway, as described (38, 39), and indicate that A-gliadin 123–132/HLA-A*0201 complexes may be generated in the mucosa after gluten intake. It is possible that A-gliadin, or other polypeptides containing A-gliadin 123–132 epitope, may survive proteolysis by intestinal enzymes, be transported across mucosal epithelium, and be processed by local APC, as recently suggested (42, 43). Based on our results, several possible models of the CD pathogenesis following ingestion of dietary gliadin can be envisioned. According to one model, unknown factors, possibly related to molecular mimicry, unmasking of cryptic epitopes, alteration, or breakdown of peripheral tolerance, may lead to activation of gliadin-reactive, class I-restricted T responses, infiltration of intestinal epithelium by CD8+ T cells, and localized inflammation. Up-regulation of class II expression on epithelial cells could then lead to the recruitment of T cells, preferentially restricted by DQ2 and DQ8 molecules, recognizing gliadin and possibly other Ags, including tissue transglutaminase, the endomisial autoantigen, or protein from cytoskeleton structure such as actin and desmin (44, 45, 46). Alternatively, it is possible to envision that the original pathogenic event in CD is recognition of class II-restricted gliadin-derived epitopes. The released lymphokines could lead to up-regulation of both class I and class II molecules and spreading of immune recognition not only to other class II-restricted Ags, but also to class I-restricted, gliadin epitopes. Future studies will address whether CTL directed against additional Ags, also implicated in CD pathogenesis, such as tissue transglutaminase, actin, and desmin, are also detectable in CD patients. These studies might help to determine whether CTL recognition of gliadin is associated with the early stages of disease, or rather a consequence of epitope spreading. At the immunogenetic level, initial reports pinpointed the association of CD with HLA-B8 and HLA-A1 molecules. However, later studies reported a stronger genetic association with DQα1*0501/DQβ1*0201 or DQα1*0301/DQβ1*0302 genotypes (reviewed in Ref. 1). In the present study, we chose the HLA-A*0201 allele because the A2 type is the most common HLA class I molecules among the Caucasian population and the majority of A2-positive individuals express the HLA-A*0201 allelic variant (47). In this context, it will be of interest in future studies to investigate the presence of gliadin-derived epitopes restricted by other class I molecules, including HLA A1 and B8. Several reports indicate that CD4+ responses in CD are heterogeneous, and several different DQ2- and DQ8-restricted, gliadin epitopes are recognized (1, 6, 8). Thus, we speculate that additional peptides restricted by HLA-A2 and by other class I molecules might be recognized by patients either positive or negative for recognition of the A-gliadin 123–132 epitope. In our study, we have detected A-gliadin 123–132 responses in 13 of 20 CD patients tested. Thus, A-gliadin 123–132 recognition appeared to be relatively frequent, and it is, in fact, striking that such a large fraction of A2+ CD patients recognized this particular determinant. Finally, we point out the possible practical significance of our results. Identification of class I-restricted epitopes might facilitate the establishment of an animal model of CD, an objective that has to date remained elusive. Experiments addressing these issues are currently ongoing in our laboratories. More specifically, we are generating by peptide immunization, gliadin-specific, A2-restricted CD8+ CTL lines and by immunization with whole gliadin, DQ8-restricted CD4+ cell lines from HLA-A2 or HLA-DQ8 transgenic mice, respectively, kept on a strict GFD. Then, simultaneous adoptive transfer of both established T cell lines will be performed in F1 hybrid-backcrossed A2/DQ8 mice kept on GCD, to break immune tolerance to ingested gliadin. If these experiments will be successful, it will be possible to use class I- and class II-restricted peptides in immunoregulatory schemes, directed at inducing a cell-mediated, Ag-specific tolerance by nasal or i.v. administration of gliadin peptides (15, 48). In conclusion, our findings provide the first direct evidence that gliadin activates MHC class I-restricted CD8+ T lymphocytes, and suggest the possibility that they might be involved in the pathogenesis of CD lesion. We thank Giuseppe Falanga and Caterina Anania (Clinic Malzoni, Avellino, Italy) for their assistance in cell irradiation, and Giuseppe Mazzarella for EMA determinations. We also thank Ajesh Mewal for technical assistance, and Robin Delp for assistance in preparation of manuscript. ↵1 This work was supported by National Institutes of Health-National Institute of Allergy and Infectious Diseases N01-AI-95362. M.D.P. and St.S. were supported, respectively, by European Union and Consiglio Nazionale delle Ricerche fellowships. This study has been carried out with financial support from the Commission of the European Community-Specific Research and Technology Development Program: “Quality of Life of Living Resources” QLK1-CT-1999-00037, Evaluation of the Prevalence of Celiac Disease and its Genetic Components in the European Population. 3 Abbreviations used in this paper: CD, celiac disease; EMA, anti-endomisium Ab; GCD, gluten-containing diet; GFD, gluten-free diet; SFC, spot-forming cell.